What is the origin of the name Google? Google is one of the largest internet search engines on the web today. Most of their competitors, including Yahoo, Bing and Ask, are too busy trying to keep up to bother trying to equal or surpass Google. Google is an innovative search engine with a team that continues to deliver - with new and better ways to search everyday. With ever changing algorithms that keep competition as well as site owners on their toes, it's no surprise they are number one. In the last year alone they've added numerous features including a new image search and a faster content search. However, Google isn't god. It didn't always exist. So the question is... where did google start? The great and mighty Google is actually based on a misspelling. The story goes that the name Googol was decided upon by founders Larry Page and Sergey Brin. The meaning of the word Googol is basically 1.0 × 10100. In other words, the word Googol is a very large number. The original idea was that this name would represent the amount of information available to anyone using the search engine - basically - a lot of information! Sean, the worst speller of the two, accidentally typed Google when trying to see if the domain was available. The pair liked it and agreed that it would make a great name. The first sponsor paid a very large cheque towards the new operation. However, on the cheque he misspelled the name of the company, calling it Google. So believe what you will. 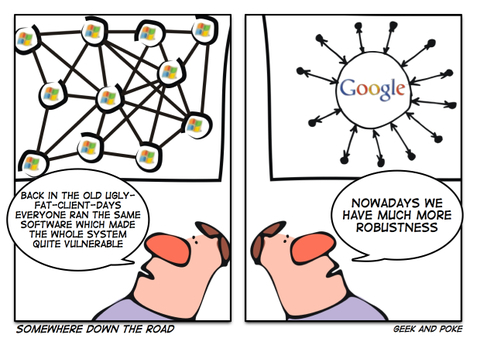 But be sure of one thing - no matter its origins, Google has become a very powerful search engine! Cartoon thanks to geek and poke. What is a Sponsored Link? Are Google, Yahoo, Bing, and Hubpages sponsored links all the same? Concise and informative. Voted up and interesting...thanks for sharing! Interesting, Question master you are a small encyclopedia. nice work and keep posting this kind of questions and answers. Interesting little hub. Strangely i have wondered this before :-)Up & Interesting. Short and to the point, answering a question I'm sure many people have. Nice job.